Pickles or tsukemono (as they are known in Japanese) are essential to most meals in Japanese cuisine. They refer to all types of pickles regardless of their flavor or ingredients. Commonly, tsukemono is served with rice dishes or in a bento (lunch box), but they are often an acceptable side dish for any meal: breakfast, lunch or dinner. There are many varieties of Japanese daikon radish pickles available for sale at the supermarket, but daikon radish pickles can very easily be made at home. These sweet, tangy and spicy Japanese daikon pickles are one such variety that the average home cook can easily whip up in 20 minutes, and you’ll be amazed at how such a small side dish of pickles instantly ups the “wow” factor to your home-cooked Japanese meal. This recipe is easy if you’ve got an adequately stocked Japanese pantry at home. With a few basic ingredients and a trip to the farmer’s market for a fresh Japanese daikon, you’ll be on your way to a fabulous dish of pickles. Using a vegetable scrub, gently wash the exterior of the daikon. Remove leafy green top. Using a vegetable peeler, gently peel and discard the exterior of the daikon skin that is discolored. 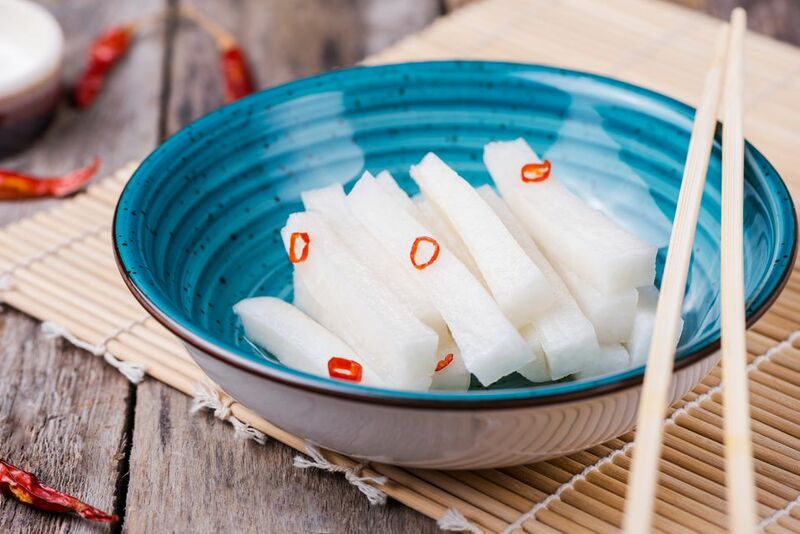 Slice the daikon into approximate 2-inch long pieces and then slice into thick lengthwise pieces. Make the pickling marinade: Combine sugar and vinegar until the sugar dissolves. Because the sugar does not easily dissolve at room temperature, optionally, the two ingredients may be combined in a small pot and heated over the stove on low to medium heat until the sugar dissolves. Remove from heat immediately. Allow the sugar and vinegar mixture to cool. Add the salt, dried dashi powder, and sake to the pickling marinade. Mix well to combine. Allow the marinade to cool completely. Add wagiri dried red chili peppers to the marinade, to taste. Omit if you prefer not to have any spice. Add sliced daikon radish pieces to a shallow resealable plastic container. Pour pickling marinade over the daikon pieces and seal the container closed. The pickles can be marinated for a day at room temperature. Then store in the fridge. The daikon pickles will keep in a refrigerator for one week. The longer the daikon radish is marinated, the more flavorful it is!